Most of us in the developed world work for someone else. We join a structured institution that coordinates our labors so as to maximize the efficiencies of production. Our lives come to depend on the regularities of routine. We invest in roots and plan our futures on the expectation of unending regularity. But the dynamism of the real world is not static. It is in constant evolving flux. Sooner or later, the regularities upon which we have built our lives will falter and fail. Millions throughout the developed world are feeling the reality of that fact today. What is it that fuels the economic world's evolving flux? Some would say the problem is a mismatch between supply and demand somewhere within the world's interrelated economic system. Recent fingers point to a tightening of credit. The situation is not unlike rush hour traffic. One car falters and thousands behind it slow to a crawl. Hold up credit for a few suppliers and the entire economy slows to a crawl. There is another way to look at things, though. In a more general sense, the complexion of the economy changes because of innovation. The tightening of supplies is merely a form of innovation. A new product that suddenly everyone wants will also shake up the system. And so will an innovation that suddenly makes that or any other product cheaper and more plentiful. It's as if we are all standing in water an inch deep. Create an interesting innovation, a new depression, and a healthy quantity of all that water is going to flow in your direction. Meanwhile, the rest of us will be standing there wondering what happened to all that water we were depending on. The interesting part is that not every innovation need result in yet another huge institution that employs thousands of non-innovators. 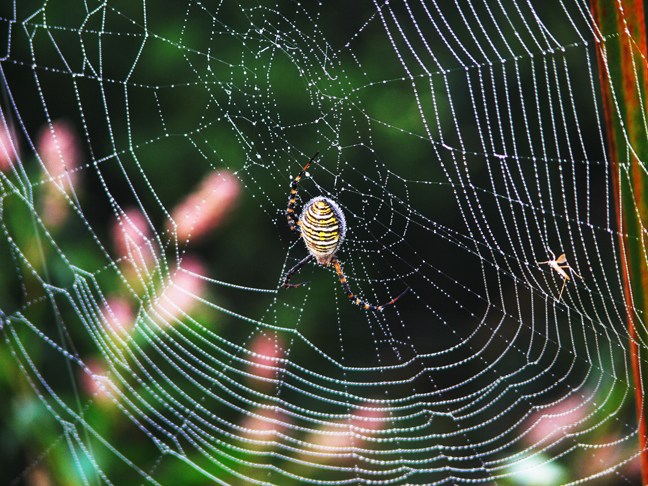 Not unlike the lowly enterprising garden spider, it most likely will always be possible to strike out on your own and create an interesting bit of innovation that results is at least a modest sustaining income. Frank Sinatra once sang a song about just such an endeavor: "I Did It My Way." And the Beatles concurred with their encouraging lyric: "Hey Jude, you'll do. The movement you need is on your shoulders." May you always see opportunity to innovate within the circumstances you find yourself.